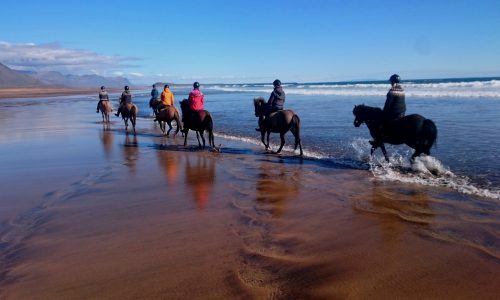 We trail from Gröf through a magical, ever-changing landscape, from rough lava, over sparkling streams and rivers, to white sandy beaches until we reach Löngufjörur, one of the longest beaches in Iceland, at spring tide. At the time of spring tide, even more of the sand is exposed and the ground is softer. 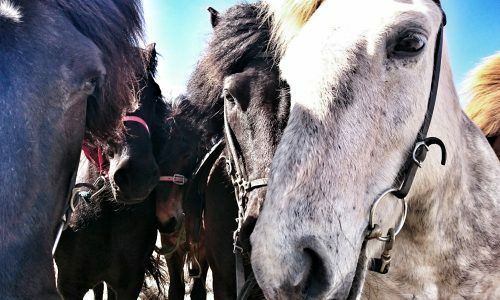 There we can ride for hours on the famous smooth gait tolt, unique to Icelandic horses, and the horses can really show their worth running free without any obstacles to slow them down. Even though the tour is a roundtrip, and the horses stay on a field where we have stopped for the day, you’ll return each day back to the farm where you can enjoy a bit of luxury in our Lodge The Holy Ram. We have double & singlerooms with private bathrooms, a great hall with a cozy livingroom feeling, where you’ll have magnificient view of the glacier Snaefellsjökull and the beach. 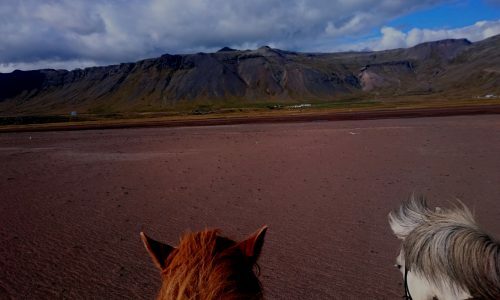 Non-riders are more then welcome to join their partners, our farm Gröf is very close by the Snaefellsjökull national park, which is a great area to hike and explore. In the neighbourhood there’s a beautiful 9 hole golfcourse for golflovers, plenty of fish in the lakes & rivers for fishlovers, or just enjoy the peacefull surroundings of our farm with a wide variety of birds. Both around our guest house and further away, various species nest. Also on our fields we have wildflowers & herbs for naturelovers, take a walk to our beach or go up to our mountains to see the waterfalls and meet our young horses along the way or just relax in the hottub, not enough? Perhaps you would like to go up the glacier Snaefellsjökull www.theglacier.is or go deep down under into a 8000 yr old mysterious Cave Vatnshellir www.vatnhellir.is We will drive you to those places on the way to our horse riding day and pick you up when the riding day is over, then you can reunite with your horselovers partners in the afternoon to sit with the group or have a lovely dinner for two and talk about the great day you each had. Before and after dinner you can have a drink in front of “the cozy fireplace” with amazing view to the glacier, the choice is yours and we’ll be more then happy to provide to your wishes. Please also have a look at our facebook page because there’re additional photos, videos and comments from our previous guests. For more information, the tour dates for 2019 and booking a tour. Our lodge The Holy Ram and farm Gröf in Breidavik, which borders almost to the Snaefellsjökull national park, is set in a beautiful location with views to the sea, the mountains and a fantastic view of the glacier Snaefellsjökull.